Razzmatazz Classic Slot Guide & Review - Casino Answers! Razzmatazz is a 3-reel, 1-line classic slot machine, featuring a wild substitute symbol. You can play the Razzmatazz classic slot game at Jackpot City Casino and All Slots Casino. Coin values on Razzmatazz are $0.25, $0.50, $1, $2 and $5. Hit “Bet One” to play 1-3 coins or hit “Bet Max” for the maximum bet of 3 coins per spin. The lowest total bet you can make on the Razzmatazz jazz slot is a quarter per spin with the highest possible total bet being $15 per spin. 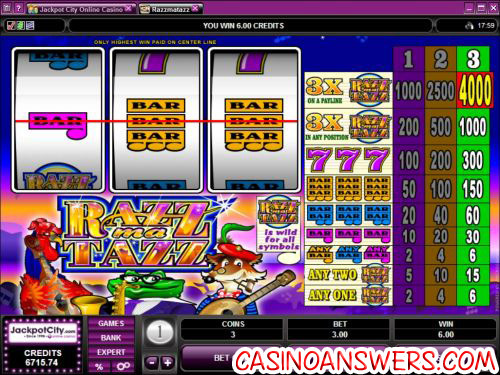 Razzmatazz is an excellent slot for casual slots players to enjoy. To play Razzmatazz, hit the “Spin” button. The highest paying symbol on the Razzmatazz slot machine is the Razzmatazz symbol. It will pay out 4000 coins when three symbols land on the center payline. What’s interesting is the game will also pay out when three Razzmatazz symbols land on the reels off of the payline. It is also a wild symbol, meaning it can replace all other symbols in to form a winning combination. There are 9 winning combinations on Razzmatazz. The full payout schedule on the Razzmatazz classic slot machine is as follows (1/2/3 coin payouts in parenthesis): 1 Razzmatazz symbol (2/4/6), 3 of any Bar symbols (2/4/6), 2 Razzmatazz symbols (5/10/15), 3 Single Bar symbols (10/20/30), 3 Double Bar symbols (20/40/60), 3 Triple Bar symbols (50/100/150), 3 Seven symbols (100/200/300), 3 Razzmatazz symbols in any position (200/500/1000) and 3 Razzmatazz symbols on the payline (1000/2500/4000). Try to see which of these winning combinations you can hit at Jackpot City Casino. If you’re looking to jazz it up by playing a lot of spins, you can do it while saving your fingers from clicking. Hit “Expert” to open up the autoplay mode. You can play 5 or 10 autoplay spins, or hit “Autoplay” to open up the advanced settings. Here you will be able to set the number of spins (5, 10, 25, 50, 100, 250 or 500), number of seconds between spins, stop when jackpot is won, stop if a win exceeds or equals ($25, $50, $100, $250, $500, $1000 and $2500), stop on any win and stop if credits increase/decrease by ($25, $50, $100, $250, $500, $1000 and $2500). You can cancel the autoplay mode on Razzmatazz at any time. Razzmatazz keeps it simple with the classic 3-reel, 1-line slot machine format. There are no surprises or interesting features. It’s just a regular classic slot machine with a frog playing the saxophone. If that’s the sort of thing you’re looking for, you can play the Razzmatazz slot game today when you sign up at Jackpot City Casino! Are US players able to play the Razzmatazz slot machine? Unfortunately, Americans cannot play Razzmatazz for real money at Microgaming online casinos. Fortunately, jazz fans can find a jazz-themed video slot called Jazz Time at the US-friendly Club USA Casino. Is there a Razz casino game?